The town forest tour is a 2 mile route through the forest linking all three hiking trails. It takes you on a route that covers almost all scenic value in the forest and at just over 2 miles is just lengthy enough to be considered for weight management purposes. While this website already has the three trails listed separately, this route loops them together to form the two mile route. 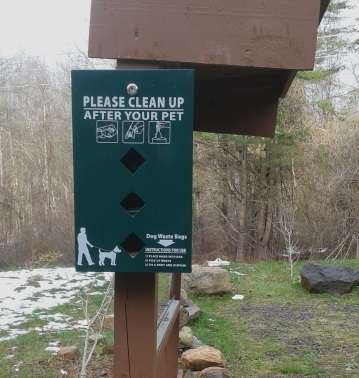 The Rockland town forest is one of the first areas of trails covered by this website. It is in continual change. This page is dedicated to highlighting those updates. More benches have added in the front of the property and more stonework throughout since the early days of it's coverage. Park in the main lot and follow the wide grass trail in. 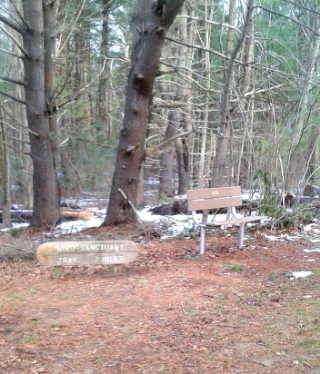 At the entrance are a couple of picnic tables and then some newer benches are found along the beginning of the trail. Very shortly on the left, in a fairly dense shade spot you will find main picnic area. There are three more tables here. Soon the trail will take a sharp left. Leading to the right at this bend, is another trail marked as a fire lane. 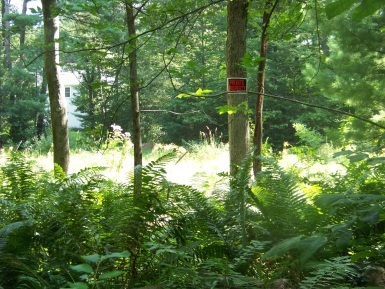 In the early days of the town forest, this fire lane helped form part of the double loop which was the only trail work through the area at that time. Houses were built and part of that loop became private property. This trail leads and stops just short of that property. Taking the left, just after a slight descend to an intersection with trail signs. A short loop can be made by going left again here. The town forest tour goes to the right on the Ingeno Trail. to the rock wall to the right of the trail. each season with missing sections. and a rustic fence added to it. Colonial history of the property! Soon you will pass by the "neighbors" houses. The previous loop end portion appears to the right. At .31 the hiking trail takes another sharp left in front of a small bog. Found a deer at this location browsing the vegetation on one of my journeys through the forest. Here the newer trails of the town forest continue. The wonderland of water and bridges starts! but it is special any time of the year. The end of Don's trail leads off to the left here. Continuing on the Ingeno trail there will be several more bridges to cross with stepping stones, another constant feature of the forest. You will hear running water and a wide section of French Stream runs to the left of the trail. At .36 miles the main water area is crossed, this is an area of several bridges connecting where the stream splits. Water seems to run everywhere here! 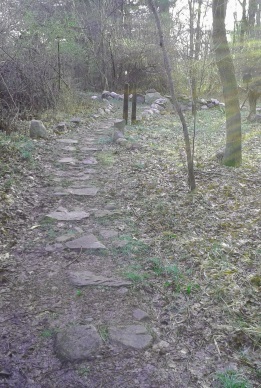 The trail soon turns to a gravel/sand mix for a short stretch, then more stepping stones and a bit of boulder culvert. 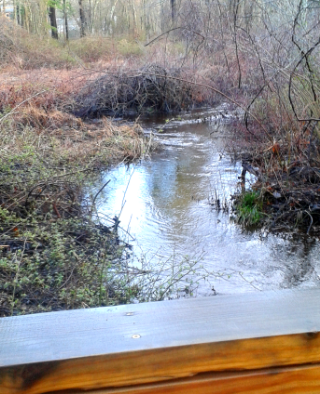 At .41 a part of the trail that runs along the stream and looks like it has been cleared. You will pass by a log bench and an area previously called Georges Island with a double set of plank bridges. The trail winds a bit after this and another open area along the stream. The 8th bridge to cross has railings on either side and offers some scenic value looking out toward an emerging power line. More stepping stones over an area that I remember became completely submerged in the early years here. A short plank and then an area where the stream has been lined by rock, helping to guide it. Unfortunately the eleventh bridge previously had a fence along it that became a casualty of winter. 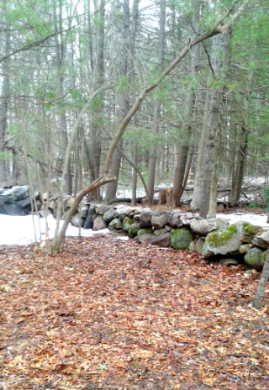 A short step down from this bridge and leads into the forest lined by fallen tree limbs. Some tree roots to deal with along the way here. At .53 the intersection with Jim's trail's end. 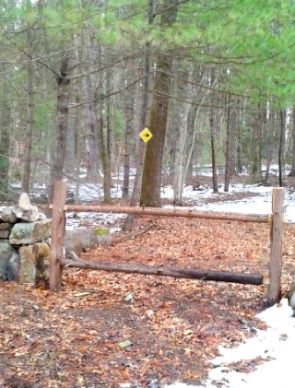 A low stone wall to mark the intersection. We continue on the Ingeno trail leading to the left. The utility line is to the left and the stream beyond it. Presently a teepee of cut tree boughs mark the trail. No doubt future building material of some sort. Soon the sound of water is heard again and the stream is found close on the left. Just after at .62 stepping stones through another wet area and a cleared area that previously was heavy with vegetation even in winter. Looks like a garden. 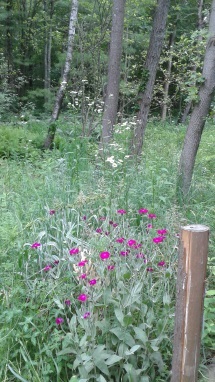 Though in the summer, not so much as it gets overgrown once again. Along the way a narrow trail leads left. The hiking trail takes a slight climb uphill past the beginning of Jim's trail and leads to the left. Stones now line the trail here and at .66 miles the inaccessible by car parking lot is entered. This is an area where many wild flowers grow. Newer flower varieties have been added, more trash and recycling cans with another picnic table and bench adorn this part of the forest. This area is good to explore. A short trail will take you down to the stream at the point where it first enters the town forest. This has been cleaned up as previously I had found many items dumped here near the stream. Another trail leads down into the utility line and connects to the narrow trail on the incline up to this area. Though in summer both these trails are a bit overgrown. 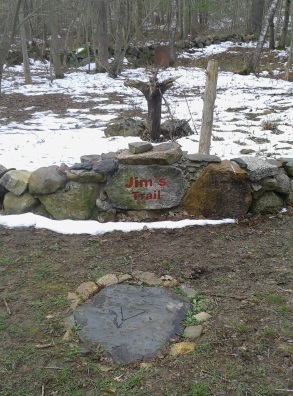 To continue on the town forest tour, turn around and follow back to Jim's trail and proceed the tour on that trail. With even the slightest explore of the end of the Ingeno trail the mileage should be at least .72. 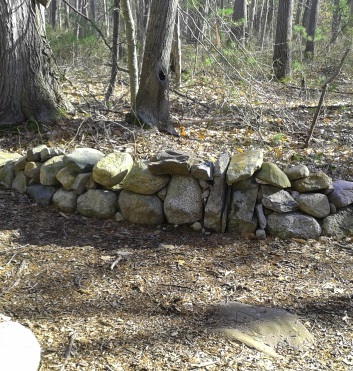 There will be a rock wall and trail lined by rock that then turns to log lined trail. At .76 a pool fronted by boulders. Here previously a balancing rock was erected, now adorned with items left by those who like to decorate the forest. 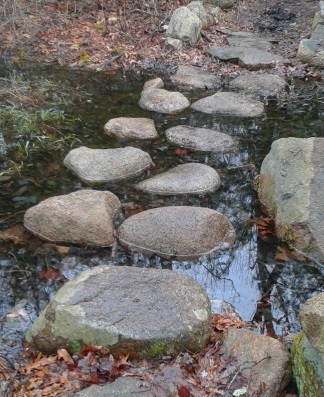 More stepping stones leading to bridge. A croaking frog announcing his displeasure as I cross. Another step down and a rock wall with yet more stepping stones to bridge # 13. 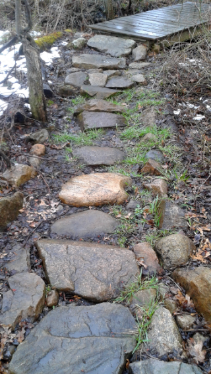 Stones cover the trail then an incline and turn to the right and a small downward dip. At .82 a new access trail leads to the left. This seems to lead to a private property. Wasn't fully investigated to see if it used an access between properties. In the summer months this path is a bit more obscure. 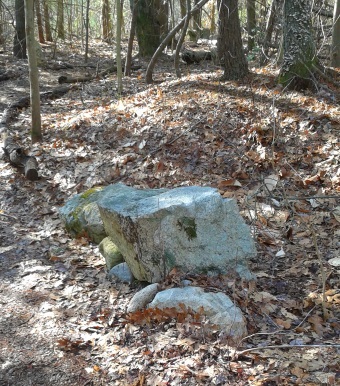 Soon the trails starts winding and becomes lined by a mix of log and granite post or boulder. It will turn to the right takes another dip and crosses water by a set of double stepping stones. 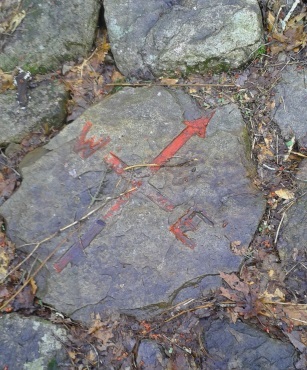 Many items have been uncovered in the trail building process in the forest. Most have been used to adorn the forest. Soon you will find an old hospital chair positioned along the trail. This trip I found a bible placed on it. At .90 a young holly tree adorns the hiking trail and both sides of the trail are lined once again. At .92 miles another granite post, newly installed. 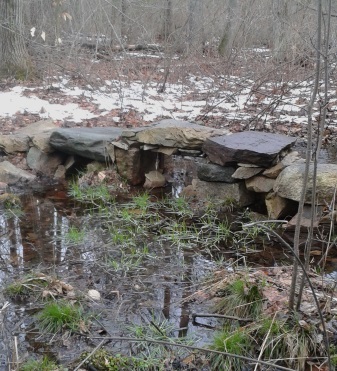 The trail now curves to the left and comes upon a three bridge series with a small island in the middle where perennials have been planted along with the rock pictured. Most likely more trail work will soon follow! The trail will start to take some sharp turns and finally takes a sharp right and meets the Ingeno trail at the end with the stone wall at 1.04 miles. Go left on the Ingeno over the previously taken route over several of the bridges til you find the intersect at Don's trail end at 1.21 miles. Go right here. 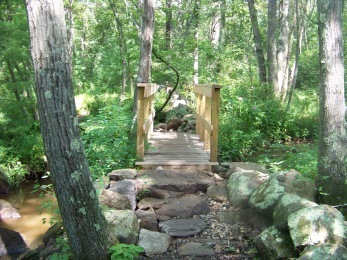 The stone bridge affords hikers a way to securely travel over the water' but is made to allow the water to flow freely! The trail quickly crosses a wet area by lined stepping stones followed by an abundance of tree roots. The trail will take a left with the stream running to the right. Next the hiking trail, at 1.36 miles will cross the bridge made entirely of stone. Then some lined stepping stones and curves to the right and becomes boulder lined at 1.41. Just after, you will find a hollowed out tree and a stone adorned with a geocache logo. 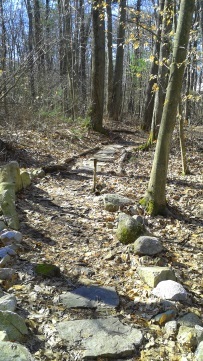 The trail becomes stone lined again and runs up and down through a tree root area and turns log lined again. 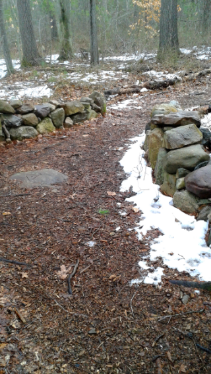 At 1.54 stepping stones at a vernal pool area, then the hiking trail runs over large tree roots, becomes almost rugged, and then boulders line only one side of the trail. Soon the trail narrows and climbs up to an area heavy with ground cover plants and a granite bench, then takes a sharp left. Straight here is an older trail just barely noticeable. If followed will lead into the bird sanctuary. The hiking trail soon leads out to across from the picnic area at 1.71. The town forest tour route now takes a right and leads into the bird sanctuary. intersect a hiking trail leading back out to the parking lot. You may be able to see your car parked there. 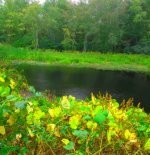 Ending your hike is a possibility, but not including the short loop through the Bird Sanctuary would be a mistake. Continuing straight, the trail will lead you out to the front of the forest close to North Ave. Here the trail turns right and makes a loop turning into a densely grown vegetation area where it was once part of a nursery. 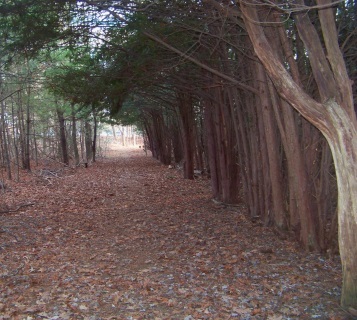 Many bushes and small trees form an archway over the trail. At the end of the archway at 1.95 turn right and follow the trail straight out into the parking area which will bring you past the 2 mile mark. the end of Jim's Trail. and line the hiking trail. 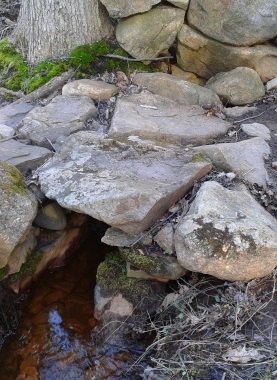 Stones form a culvert on the trail. From exit 14 follow Hingham St into Rockland. Take a right on Webster St (route 123). Continue straight to end at Union St in Rockland Center. Take a right. At next set of lights take a left on North Ave. Follow past intersection where route 139 emerges. Town Forest is immediately on the right. 2 miles following this route.